Only one frame was needed for Sound! Euphonium to flaunt its triumphant return. With the single shot shown above, Tatsuya Ishihara was able to definitively storyboard the almost non-existent time-gap between the show’s two seasons, while at the same time, encapsulate the essence of the drama that still reside within the concert band: who has shrugged off the doubt and resorted to continue on their quest for perfection, and who’s still being trapped within their own past, unable to continue? Bathed in a sunny back-light, Kumiko’s ascend upstairs had purpose, a sense of forward vision. Mizore is chained to the bottom of her staircase grasping her own mouth, almost choking on her own memories as ‘Polovtsian Dances‘ from Borodin’s ‘Prince Igor’ opera echoed from the school building’s rooftop, thanks in no part to her middle school band-mate Nozomi. Italian musical term, an indication to play in a very quick, upbeat tempo; ‘lively’. Rather fittingly, Sound! 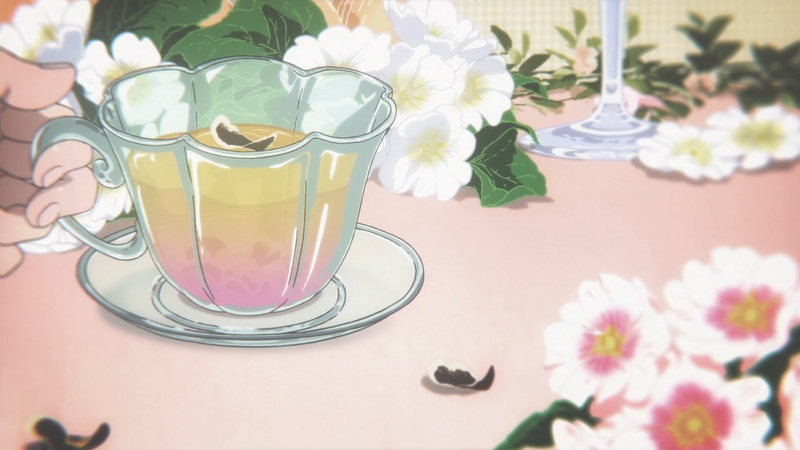 Euphonium 2’s ED song opted for the title ‘Vivace’, which accompanied an extremely feminine and pastel ending sequence directed aptly by relative newcomer Haruka Fujita; whose creative presence in sharing the episode director position with Ishihara were explored in pain-staking detail in Sakuga Blog. However, this musical term’s larger implications in describing the overall personality of the series thus far can still be considered an understatement: Eupho’s world is organically lived-in, passionately human and almost disgustingly gorgeous. Of course, many elements which I feel the show has perfected over the course of its first cour’s run, has eventually designated it as my absolute favourite anime franchise of all time, narrowly beating out Yasuhiro Takemoto’s inspired directorial take on Honobu Yonezawa’s novel series Hyouka, another baby of Kyoto Animation. This second cour’s double length premiere and follow-up episode did nothing to even budge its grasp on the throne, as it solidified its predecessor’s sown relational dynamics, fleshing out the characters’ in-band relationships, generating a less on-and-off screen, but a more directly malleable interactivity between the main characters and the audience. Not many anime TV productions can juggle so many personalities at the same time, and still manage to maintain distinctive flavours in four across-franchise main characters, three seasonal main characters (so far) and a slew of supporting characters. 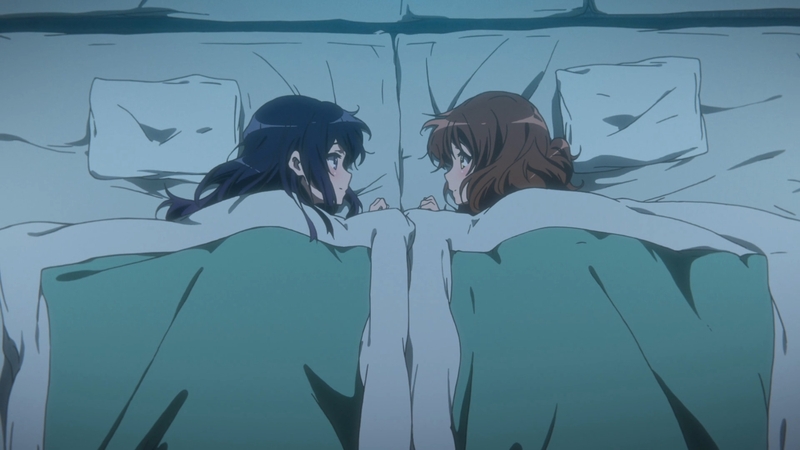 Central to the series thus far had been Kumiko’s relationship with Reina. In observing the friendship from its pure cinematic qualities, this relationship’s less-than-humble origins and its current stage were developed with little wasted dialogue and scene setting. Kumiko’s pledge to wake up hours earlier than before to attend band practice with Reina before school is a direct testament to her character’s attitude change; a pay off that’s extreme satisfying ever since Kumiko’s cathartic breakdown in last season’s episode 12. As for Reina…I hesitate to write in detail about her in my most subjective angles, since the character never truly resonated well with my own creative ideologies, thus preventing me from truly exploring her less self-centred traits with a more level-headed manner. However, contrary to my expectations, Reina’s emotional maturity are in some ways mirrored against Kumiko more directly than I expected: Kumiko’s more polished ability in social interactivity has managed to spur her to lower her guard against the former’s classmate friends Hazuki and Sapphire. Reina’s relative inexperience in expressing verbal desire for friendly interactions were excellently framed by the constantly shifting character presence in the show’s consistent scene setting on the train ride to and from school, where the maintained location were contrasted with dynamic interactions and moods: it’s rather telling, considering that when Hazaki’s on-board, her bubbly presence dominated the conversation, with Reina only speaking up when she was alone with Kumiko. Conversely, Kumiko’s comfortably teasing disposition is only present at large when she’s alone with Reina. 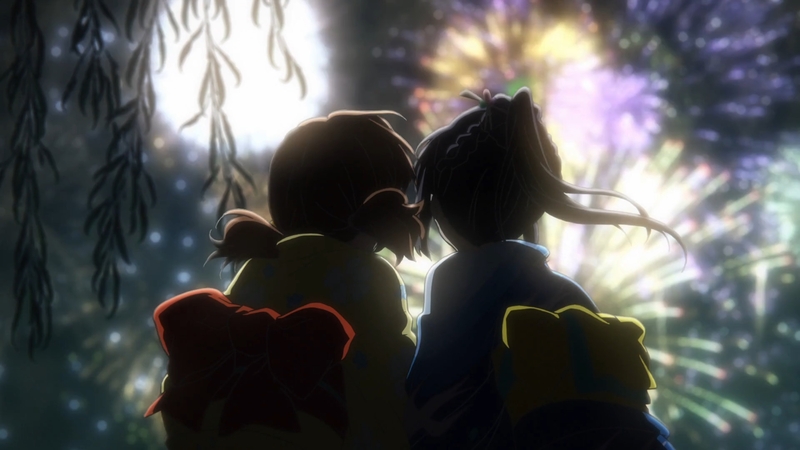 Interestingly, the two characters’ ideological differences start to show when they attend the fireworks together: the fiery indifference of Reina concerning Nozomi’s failed attempt in winning Asuka over in allowing her to rejoin the band: she shouldn’t be allowed back in, since the greater good of the band called for it; and Kumiko’s masked indifference towards the matter (shown to be ultimately false, as Kumiko took upon a more active role in the conflict next episode). Gazing forward to the future: one of vivid unpredictability. Also, do note the vast number of ambient colouring palettes utilised by the staff in depicting the climate and time shifts of the show. I daresay this single episode had attempted way more climate, weather and time shifts in scenery depiction than many shows managed in their entire run time. 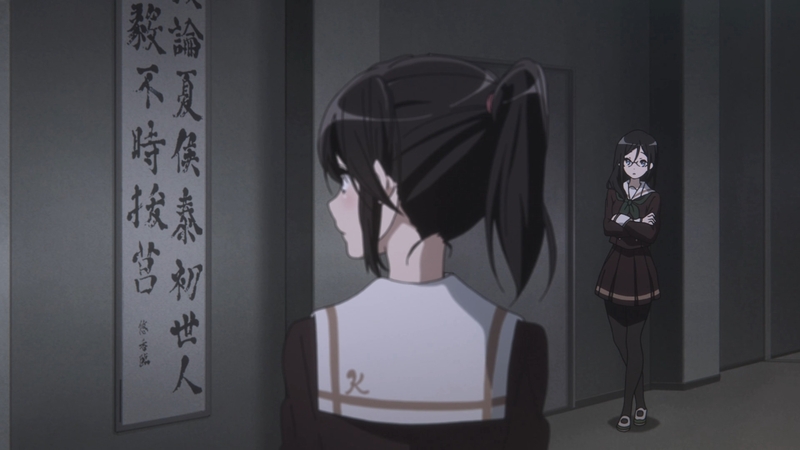 Whilst the second episode’s more direct focus on Nozomi has taken much of the thematic focus away from Reina, the series made do with standalone moments of quiet intimacy, as Reina kept Kumiko awake at night for emotional assurance in regards to Taki-sensei. Though at the same time, it didn’t deter from making a few visual jokes at the expense of Reina, as the frame cuts between her paralysed expression upon reacting to band gossip; regarding Taki-sensei’s possible romantic relationship with Niiyama-sensei, with disguised environmental shots of two beetles knuckling heads, with another bug sitting idly above them. Another smaller bug also sat there, presumably observing the whole thing with bemusement. Eupho’s second episode was a bit more retrospective in framing the ongoing lives beyond the band. While the first episode placed much emphasis on the former middle school mates Yuuko, Nozomi, Natsuki and Mizore, its tone focused much less on progress, but rather on regret. 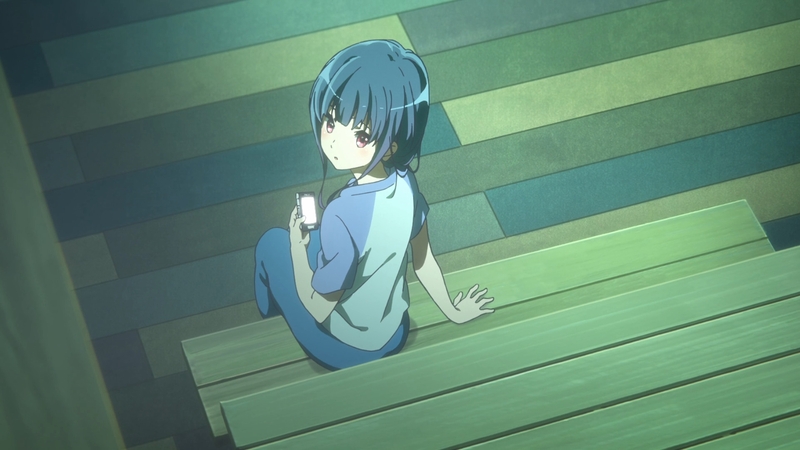 The pool sequence in the first half of the latter episode made ample attempts in further establishing the friend circles within the band, indulge the audience in their interactional tics, while also placing some telling metaphorical hints at Kumiko’s changing role in the band dynamics. 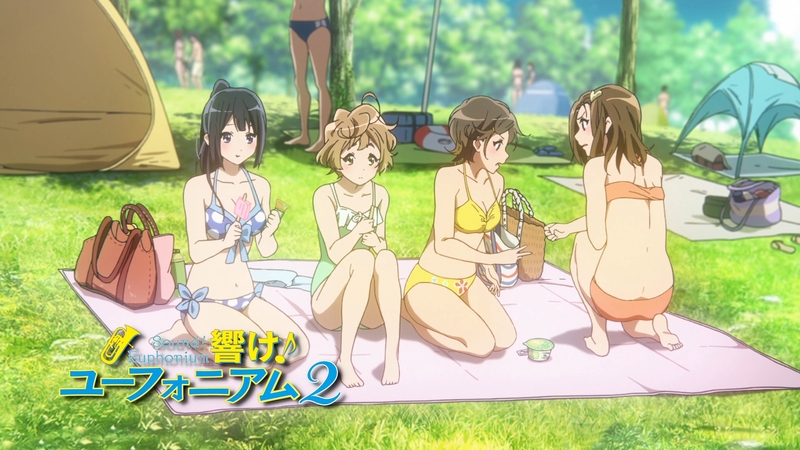 In addition, the always entertaining banter between Natsuki and Yuuko were spot-on and has established its own tonal presence as a personality flavour within the ensemble, while cutaway shots of Hazuki with her competing for some snacks with her Team Monaka senpai, further hints at slowly advancing relationships. Ultimately, the band feels like a living organism, its life advances even when the camera’s not lingering on them. Circling back to this post’s introductory remarks: ensemble drama is ultimately at the heart of Sound! Euphonium. I consider a musical ensemble to be a rather indicative microsom of artistic and ideological conflict: a clash of personalities, ethics and talent. A jumble of paintbrushes all trying to leave their mark on the canvas. Last season saw Reina’s clash with Kaori as the centre spectacle, surrounded by a collection of subsequent conflicts. Kumiko’s own narrative arc also delves into the ideological shifts that one requires to translate talent into skill. Consequently, the introduced mysteries regarding the massive amount of high-tailing amongst the second years in the previous school semesters, were brought up once again in episode one. Kumiko and her gang’s remarks in the inability of their seniors to include them in their problems, have become quiet the stigma that may well derail their momentum. Asuka stands as perhaps THE most secretive, charming, unsympathetic and deceptively ruthless character of the entire series, and that’s precisely what makes her so delightfully unbearable to watch when she repeatedly sidesteps and outright rejects Nozomi’s appeal of sentiment, in order to feel ‘worthy’ of rejoining the band. Incidentally, in understanding the circumstances of her departure, Nozomi’s case is a unfortunate one that has no one simple answer. Asuka’s uncompromising attitude towards the situation remains masked behind a pretty face with glasses. Much has already being said about the third year seniors of the previous year and their less than appealing apathy towards band practice, but the curious third wheel of the bickering between Asuka and Nozomi came from last season’s standout side character Natsuki. Additional strokes of character had being added to her, as she portrays herself as a relatively relaxed and easygoing girl, who harbours intense but usually subtle loyalty to her peers and juniors. Kumiko’s increased involvement in her seniors’ lives are welcoming, in that it demonstrates a change in her character that’s ultimately rewarding to observe. Her interactions with Nozomi was emotionally charged on a cinematic level, and her vocal devotion to help her senior in her cause is still understandably met with partial regret later; a human being who’s trying to improve is bound to overstep herself at times. As for Mizore, the mystery that surrounds her are still aplenty, despite she has an open enough character to allow herself a conversation with Kumiko. No doubt the series will see fit to give her more time in the spotlight. At the end of the second episode, I will be halting my weekly engagements with the show, in the hopes of having a chance to marathon it on a later date, preferably in time for a best of year post. Sound! Euphonium 2 hasn’t lost its shine just yet, and its compositional polish is admirable in almost every conceivable way.